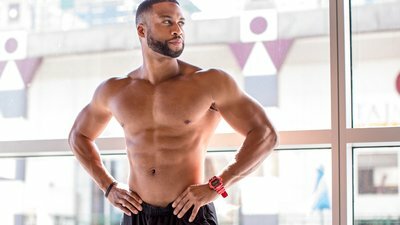 Team Bodybuilding.com athlete and fitness entrepreneur Rickey Jasper II earns a coveted spot as one of 30 hopefuls on this season's "The Bachelorette." The first thing you notice when you meet Rickey Jasper II is his smile. And for good reason. The Team Bodybuilding.com athlete and fitness entrepreneur exudes smiles and positivity no matter what life throws his way. And now that Jasper is appearing as a contestant on the upcoming season of "The Bachelorette," he'll be flashing that beaming smile for a whole new audience. Things weren't always smiles and sunshine for Rickey Jasper II. After a few career setbacks, this Virginia native found himself out of work and back at home, living with his parents. Determined to make it on his own, Jasper made a bold move. In 2016, Jasper packed his bags and moved across the country to San Diego, where he launched his online coaching company, 4:13 Health and Fitness, inspired by the bible verse Philippians 4:13, "I can do all things through Christ who strengthens me." "I started 4:13 Health and Fitness out of a place of pain," Jasper explained via his Instagram feed (he's not allowed to give interviews during the filming of "The Bachelorette"). "I wasn't happy with where I was, and I wanted more out of life. I got serious about creating an online personal training company that could help people feel more confident, become fitter, and truly take a leap of faith to go after their passions." As 4:13 Health and Fitness grew, Jasper found his calling by helping others achieve better health and fitness. "Serving others can happen in millions of ways but it's best to find out what way suits you," he explained. "Helping others is a way to shift the focus from your problems and help people get past theirs." But success didn't stop there. In January 2017, Jasper landed one of the coveted finalists spots for the Bodybuilding.com Spokesmodel Search, flying to Bodybuilding.com HQ in Boise, Idaho, and signing on as a Team Bodybuilding.com-sponsored athlete. By then, Jasper had launched his own line of fitness apparel and was winning over fans and fellow athletes alike with his upbeat attitude and warm smile. "Walking through the LA Fit Expo and hearing people yell, 'Rickey, I follow you! Can I get a picture!?!' was the most insane and motivating feeling I've ever had," Jasper recalled in a January 2017 post. When considering next steps, the possibilities seemed truly endless. "I have so many massive goals and I truly thank God for showing me that all things are possible," he explains. "The scary thing is, I don't think I have even scratched the surface as for what's to come." Just a few months after his initial visit to Bodybuilding.com, Jasper returned to Boise to put his fitness and on-screen presence to the test by starring in one of Bodybuilding.com's first follow-along training programs on All Access, The Total-Body Dumbbell Fix. Even filming back-to-back workouts during rigorous 10-hour production days couldn't dampen Jasper's spirits. Watch the videos for even a grueling workout like Man-Maker Mayhem, and you'll see him smiling the whole time. People who have followed the workouts have also noted how much they appreciate his willingness to sweat and suffer through the workouts, rather than trying to make it all look easy. Now that Jasper has landed a spot as one of the 30 eligible suitors vying for Becca Kufrin's affections on ABC's upcoming season of "The Bachelorette," his fit physique and good-natured attitude are already garnering a lot of attention. Though we can't yet predict how this season will play out, one thing is for sure—Jasper's star is on the rise.